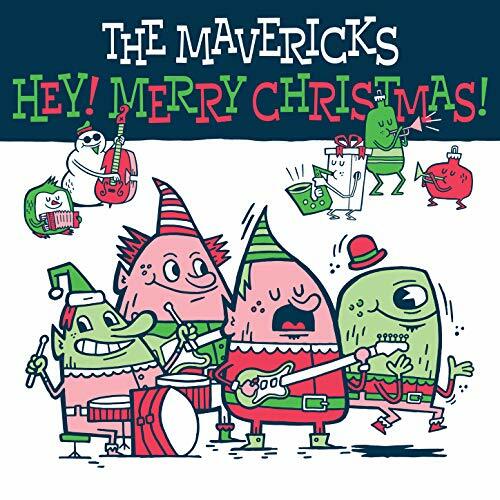 Genre-defying, Grammy Award-winning band The Mavericks have announced the November 2nd release of their first-ever holiday album, Hey! Merry Christmas!. Always a group to forge their own path, The Mavericks wrote eight original songs for Hey! Merry Christmas! featuring the group’s distinctive blend of rockabilly Latino, folk, swing, blues, jazz, and more. The new songs inject a fresh style and sound into the holiday season while seamlessly fitting into any rotation of Christmas classics. The new collection includes The Mavericks’ renditions of two yuletide favorites ”Christmas (Baby Please Come Home)” and “Happy Holiday”. Led by the incomparable vocals of Raul Malo, drummer Paul Deakin, guitarist Eddie Perez and keyboardist Jerry Dale McFadden, The Mavericks will embark on their 30th Anniversary in 2019, but not before establishing some new holiday music traditions. From the rollicking opening tracks ”Christmas Time Is Coming Round” and ”Santa Does” to the gorgeous, jazzy ballad ”Christmas Time Is Coming Round” and ”Santa Does” to the gorgeous, jazzy ballad ”Christmas For Me Is You” to the sultry blues of ”Santa Wants To Take You For A Ride” The Mavericks help redefine what the sounds of Christmas can be.